And the successful results show up on the blog! You all have been loving my lentil brownies and this Chickpea Cookie Pie. In this version, I use chickpeas for a fudgy delicious brownie! These Vegan Chickpea Brownies need a few ingredients, cooked chickpeas, nut butter or seed butter, chocolate in various forms (melted, chips and cocoa powder), vanilla, almond flour and baking powder. They are also grain-free!, have no added refined oil or added refined sugar. There might be sugar, oil in the chocolate chips depending on which you choose to use. There are brands that use just cocoa butter and are unsweetened or sweetened with stevia. These Brownies are smoother(no bean skin! 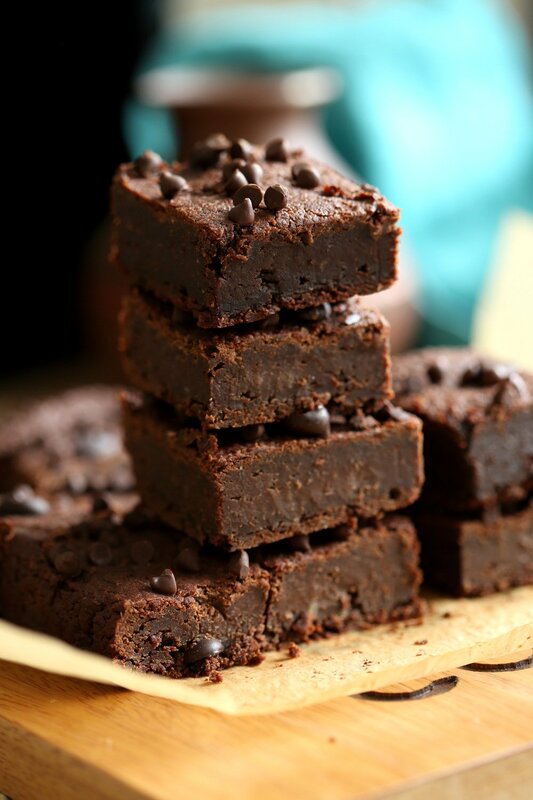 ), fudgyier and tastier than bean brownies and use less sugar and fat than regular brownies. Everything gets added to a food processor to process to a smooth stiff batter, which is spread in a brownie pan and baked. Serve these warm with vegan ice cream! The post Vegan Chickpea Brownies Grain-free GF appeared first on Vegan Richa.